"The color blue is a symbol of peace, and this holiday season we urge all Americans to remember our domestic peacekeepers — the men and women of law enforcement — by putting blue lights in your windows and trimming your tree and home in blue," said Craig W. Floyd, chairman and CEO of the National Law Enforcement Officers Memorial Fund. "Blue lights during the holiday season are a visible reminder of the service and sacrifice that law enforcement officers make on behalf of all Americans 365 days a year." For information about the Memorial Fund, visit www.LawMemorial.org. To learn more about Concerns of Police Survivors, visit www.nationalcops.org. Each x-mas I decorate the exterior of my abode with blue lights for this very reason. If I get a chance, I will try to post a pic of my decor. The Indiana Law Enforcement Academy also holds a special "Blue Light Ceremony" each holiday season to honor fallen officers. When I was in the academy, we set up the ceremony. We had the academy looking absolutely spectacular. And I must admit I designed the major feature that had a light and flag for each fallen officer in the country that year. There was debate over what shape to put it in so that it would look good and allow people to walk through it and see all the names that we wrote out. I picked a chevron pattern that everyone seemed to like, and the symbolism was nice. Some had wanted crosses, and such. I'm glad I came up with a good alternative. I wish I had pics of that night. And now, just this morning in Washington state, another FOUR brave officers have been killed. Our hearts go out to their families and loved ones... including their brothers and sisters in blue. Again this holiday season, may there be many blue lights of remembrance in windows across the land. Rest in Peace, brave ones. My tree has always been lit with blue lights only, long before I heard of this tribute. So in order to actually PARTICIPATE in honoring fallen officers I've now placed a blue light in the front window. And I have to say... finding a blue bulb that doesn't glow almost white when turned on is NOT EASY! They look fine in the store, but once you get them home most look like a fluorescent with a blue tinge. Finally found what they call a "cherry bulb" in blue... 7 watt ... but it's true blue and looks beautiful from outdoors. And Hoosier...do they still follow the tradition at the Academy? If so, and if they've carried on the design you came up with (kudos on the idea of a chevron), maybe you could get a pic from the current year and let us see what it looks like. You say it looked spectacular, and I bet it did! They do hold the ceremony every year, but I think each class tries to put their own spin on it. So I don't know if anyone has used my idea since then or not. I went back a year or two later to see the ceremony and I think that year, they just put the lights/flags for the fallen officers in straight rows. But it's good to see that having the ceremony is a tradition there that keeps on going strong. It was interesting the weekend that we got the grounds ready for the ceremony. It was all done by the recruits, with only minimal guidance from the staff. And some of the people there to help weren't who you might have expected to make a point to give their time to help out. And some that you would expect to see there (cause they talk/act like they are all about it) didn't show up. I think the list of those who showed up was maybe the best list we could have had of those in the class that were truly going to be great officers, because you could tell they had it in their hearts. Washington State lost four police officers recently. Law Enforcement Agencies from across the U.S.A. , Canada as well as Fire depts. from all over Noth America were there to pay tribute to the slain officers and their families. The attendance and reverance was indeed historical. LET THEM NOT HAVE DIED IN VAIN ! and that they may be WELL LEARNED ! 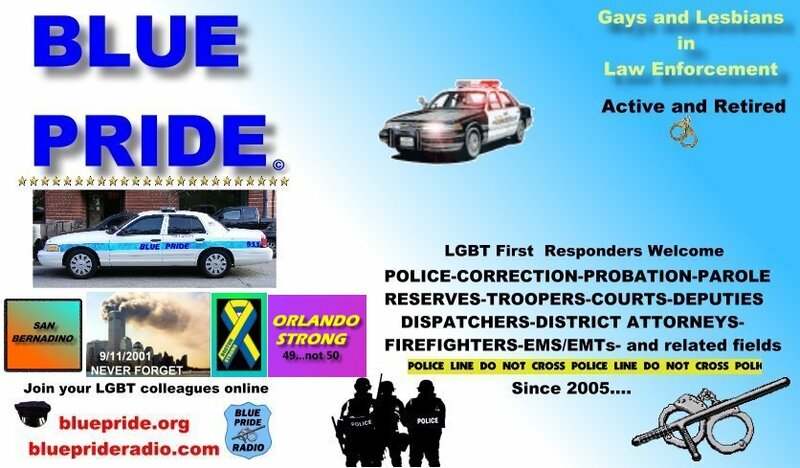 It's not too early to post a reminder for all to display their blue lights to honor fallen officers...and to make new BluePride members aware of the tradition if they were not already aware of it. ]I just want to say that the first thing I will be doing once I get off duty at 0800 tomorrow I will be setting up my blue lights to honor our fallen heroes. ..... and a Respectful SALUTE to you, Josh. Putting up blue lights to honor our fallen is exactly the kind of ritual I wrote about in caring for ourselves as we remember those who are not with us this year.